Amanda Hellman and her husband, Gus Lang, had been planning their honeymoon to Costa Rica for months, setting up a travel gift registry where friends and family could donate to the trip that was supposed to start off their married life together. One of the excursions funded for the Madison, Wisconsin couple was a whitewater rafting trip down the Sarapiquí River, 100 kilometers north of the Costa Rican capital. Rains had raised the level of the river at the end of January, when the couple was getting ready for their excursion. In general, the more water flowing through a river at a given time, the more dangerous it can be to raft. Some outfitters had canceled one or more trips that week down the Sarapiquí, which includes Class III rapids, citing risky conditions, according to interviews conducted by The Tico Times. On Jan. 29, the newlyweds were on the river when three people, including Hellman, were thrown from the raft. Two were pulled to safety, but Hellman was caught in an undercurrent and drowned. When the Red Cross arrived, they were unable to revive the 35-year-old. Hellman was one of six tourists who died in Costa Rica during the month of January, according to police reports. Three tourists, one each from the United States, Canada and the United Kingdom, died on Jan. 9 when the Pura Vida Princess catamaran capsized off the central Pacific coast, with more than 100 people on board. On Jan. 26, a 70-year-old woman and a 2-year-old girl from Canada drowned at Playa Hermosa, in the northwestern province of Guanacaste. Despite Costa Rica’s international reputation as an adventure tourism destination for the last 25 years, the industry remains lightly regulated, and safety requirements are largely at the discretion of individual businesses, according to interviews The Tico Times conducted with business owners and industry and government representatives. Debates about adventure tourism safety have been going on for years. A non-lethal rafting accident in 2006 prompted renewed calls from the industry to better regulate safety on Costa Rica’s rivers, as The Tico Times previously reported. There has been little action since then, but that might soon change. Costa Rica’s image as a destination for wild nature and adventure chafes against the need to protect travelers – foreign and domestic alike – from the dangers inherent in many popular activities, from zip lining, to swimming in the ocean without lifeguards, to whitewater rafting. “These are accidents that involved adventure tourism where there is an implicit level of risk,” Alfredo López, manager at the Costa Rica Tourism Board (ICT), told The Tico Times in a telephone interview. “These are things that unfortunately happen,” he said. 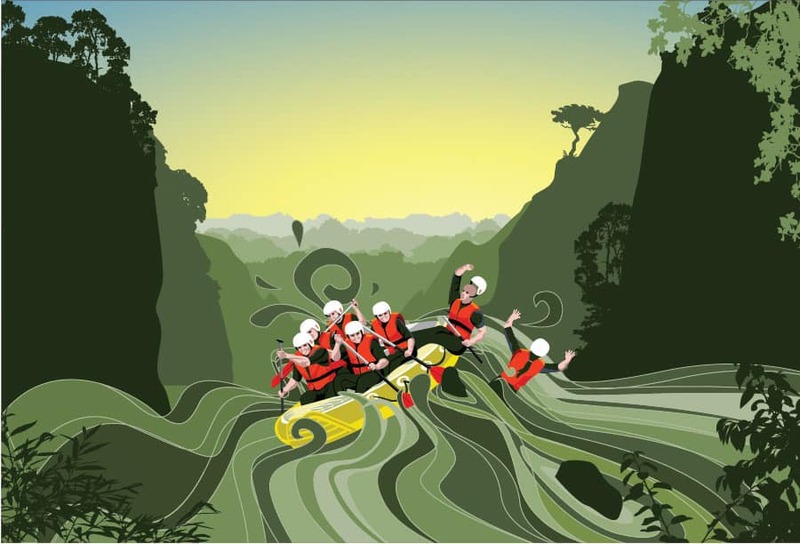 Whitewater rafting is among the more dangerous activities in which tourists can participate here but accidents are rare. Rapids are categorized by difficulty, obstacles and water volume into six categories, from floating down the river in a Class I to a dangerous vertical drop in a Class VI rapid, said Johana Argüello, a guide with 15 years experience on the Sarapiquí River and president of the Adventure Outfitters Association, an organization that represents 60 tourist operators across Costa Rica. Class III rapids, the kind that Hellman passed though when she fell overboard, is considered “intermediate” difficulty and still acceptable for first-time rafters, Argüello said. The guide said that any rapids over a Class IV requires participants to be in good physical conditions and with previous rafting experience. Argüello said the Sarapiquí has become mercurial in recent years and conditions can change suddenly. She said they had noted an “important” change in the river’s conditions the week that Hellman drowned. Her company, Aventuras de Sarapiquí, cancelled one rafting trip that week, citing the age of the passengers and their own concerns about the river’s safety. La Fortuna-based Wave Expeditions, which operated Hellman’s tour, would not comment on the accident, citing an ongoing investigation, according to an email addressed to The Tico Times. There are no official rules governing what water level is acceptable for a safe trip, Argüello said. “There is no established policy at this time. … It’s something that is at the discretion of the company, be it the manager or the head guide,” she said. Both Argüello and Michael Kaye, founder of Costa Rica Expeditions and a guide with more than 30 years experience in the adventure tourism industry, mentioned mutually agreed upon high-water marks that would plumb a dangerous depth for the river as a possible solution to reduce risk on the rapids. Kaye, whose company operates tours on the Pacuare River, said that all the companies operating there have agreed not to attempt any runs if the water exceeds a high-water marker. The Sarapiquí River has no such warning. Argüello said that a previous marker was washed away in high water in November 2014 and has not been replaced. The Sarapiquí guide added that the marker would have been downstream of where Hellman’s group put in. Head guides or tour operators ultimately have the final say when it comes to the conditions on the river and the abilities of the people on board the raft. Kaye said that guides have an incentive not to take unnecessary chances in bad conditions. “They’re on that boat too,” he said. Besides mutually agreed upon high-water markers, Kaye suggested that guides should have to renew their Red Cross cardiac and CPR certifications more frequently. The lack of safety regulations in force for maritime tourist activities came under fire after the Pura Vida Princess day cruise sank, drowning three tourists and attracting international attention. Authorities have pointed to high winds and rough seas in the Gulf of Nicoya as the likely cause. 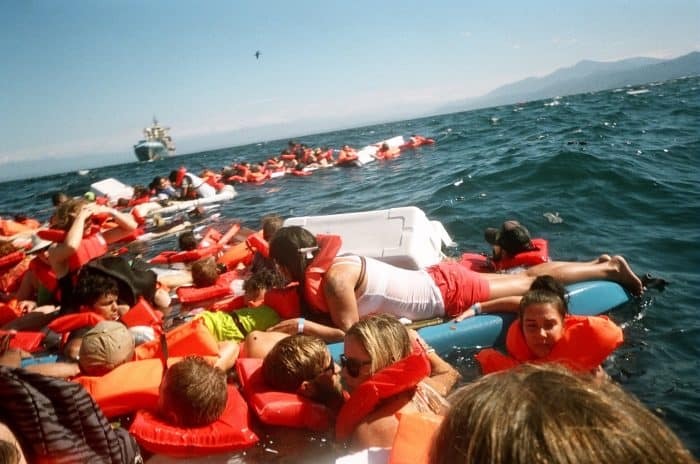 The Tico Times previously reported that the president’s office would seek legislation requiring the obligatory use of life jackets on all tourist vessels after floatation devices were distributed only after the Pura Vida Princess was in immediate danger of sinking. In 1997, another catamaran, the Pacific Princess, sank in the Gulf of Nicoya and two passengers drowned. More than 18 years later, promised safety regulations, including no-go weather conditions, had yet to be approved when the Pura Vida Princess went down. Luis Fernando Coronado, director of the Public Works and Transport Ministry’s (MOPT) Maritime-Port Administration, previously told The Tico Times that since the 1997 accident there have not been any updates to rules governing MOPT’s ability to punish private and passenger ships for violating maritime safety and administrative requirements or heeding Coast Guard recommendations. The Aquatic Navigation bill, which would give the Port Authority the powers to enforce stricter safety requirements for tourist vessels, has been languishing in the Legislative Assembly for more than two years. Coronado said that if the Aquatic Navigation bill were law, the Pura Vida Princess would have been banned from leaving port if the Coast Guard determined that conditions were too dangerous, and he noted that the bill includes a specific article on meteorological conditions. The Judicial Investigation Police are still investigating the shipwreck at this writing to determine if the Prosecutor’s Office will bring charges against the company or its crew. The U.S. Embassy in San José and Costa Rican authorities are in discussions regarding possible technical assistance for the investigation, according to statements requested by The Tico Times from the embassy and the Prosecutor’s Office. 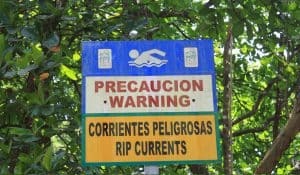 Riptides are a danger at many of Costa Rica’s idyllic beaches. More frequently traveled beaches, including Jacó and Isla Tortuga, have organized lifeguard watches, National Tourism Chamber (CANATUR) President Pablo Abarca told The Tico Times. While other beaches have warnings posted about riptides, these initiatives remain limited to local businesses or individual municipalities, Abarca said. Many of Costa Rica’s beaches offer no supervision or warnings about swimming conditions. More oversight a bad thing? The adventure tourism industry has been lightly regulated since its inception some 30 years ago, but the Health Ministry has been in talks with CANATUR and other tourism representatives to draft new, more rigorous safety requirements. The CANATUR president said that the standards under discussion were crafted with input from the industry. Abarca, who said that the new rules were already underway before the string of accidental deaths in January, said the regulations could be ready to present to the Legislative Assembly in the next few months. But not everyone is happy about the possibility of additional oversight. “If they regulated us like MOPT regulates driver’s licenses, we’d have 10 deaths a month,” Kaye said, adding that he was skeptical of governmental organizations with little knowledge of activities like rafting, for example, regulating the business. Argüello argued that the rafting industry in particular has developed its own rigorous standards without government oversight, including those of the International Rafting Federation. “We, the tour operators, have self-regulated and kept an eye on ourselves with very high standards, including some better than in places in the United States,” Argüello said. The AOA president said she supports stronger regulations as a means to crack down on informal tour operators, alleging that these outfits were less safe than their institutional peers. Wave Expeditions, however, is a formal business that received a Certificate of Excellence in 2014 from TripAdvisor. The ICT representative said that accidents like these are a learning experience and drive the industry to do a better job reducing risk and improving safety to keep Costa Rica well positioned on an international scale. Argüello told The Tico Times that it had been more than 10 years since someone died on the Sarapiquí River. Of course, adrenaline aside, businesses need to minimize the risk that their passengers face, regardless if the activity is a catamaran day cruise or Class III rapids. “Unfortunately, it can happen to any of us,” Argüello said.